We have released an automated patch/update v2.2.26 for the WHMSonic software. Your software probably has already updated and you should see v2.2.26 on your WHMSonic root main page under the "Update & Version". If not, click on "Update Now" button. Email send functions for; Resend account email(Blank email), Radio creation welcome email, API connection email bugs are fixed. cPanel WHMSonic main page 500 internal error on some servers due to missing main user folder issue fixed. Radio & Account Packages, editing existing package hosting limit does not reflect the users limit in system bug fixed. Radio & Account Packages, AI is updated to eliminate human errors during package edit and updates, such as setting zero space or missing limits which are then causing cPanel WHMSonic login errors and software function issues. Transfer All Radios feature is now back and available, all migration/transfer issues are fixed. A new 'How to transfer all radios' article added to support portal. Email Template feature is now UTF-8, you can now use none-english characters and your own language in the Email Templates. Email Template feature Firefox and IE bugs are fixed. Please update your Firefox to the latest version from firefox official website. The old versions may still cause issues if you are using outdated version of firefox. A new Email Template manager design is released, due to old system we have re-designed the whole Email Template Feature from the scratch with full off JQUERY and Bootstrap. The editor is also redesigned. Login to your WHMSonic root >> Click 'Email - Templates' from the left menu. A new function in the email templates manager page, it is now possible to reset the templates to default WHMSonic template. Click on red 'Reset To Default' button on the page to reset it as default. This is also useful for people who lost their template completely due to Firefox bug, therefore getting "Mailer Error: Message body empty" error while sending emails. 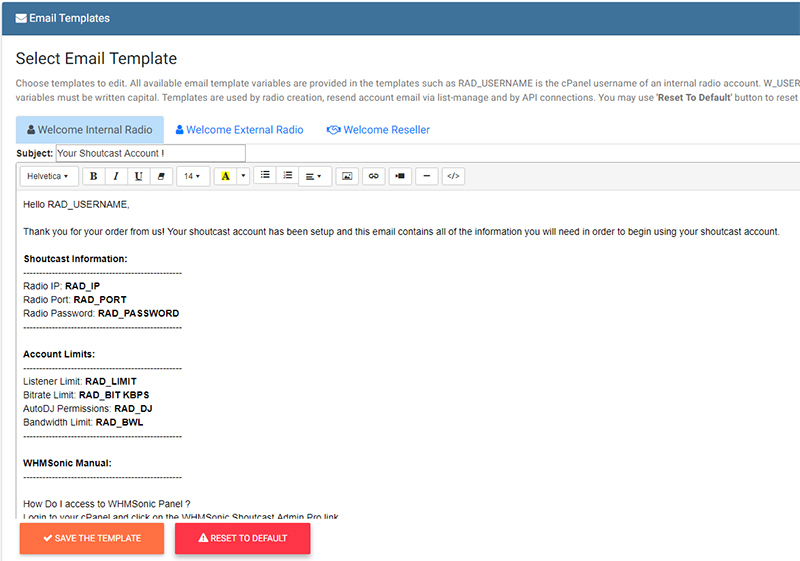 We have also removed the blue color from the old templates, if you are using default WHMSonic email templates, we recommend you to reset your all templates to default. Simply click on tabs to edit templates.